Speaking for myself, it’s hard to believe that just a little over 2 years ago in October 2010, many were rejoicing the GA release of vSphere 4.1 and its awesome new features and added scalability. It seems so long ago. The following February 2011, Update 1 for vSphere 4.1 was launched and I celebrated my one year anniversary as a VCDX certificate holder. Now two years later, 5.0 and 5.1 have both seen the light of day along with a flurry of other products and acquisitions rounding out and shaping what is now the vCloud Suite. 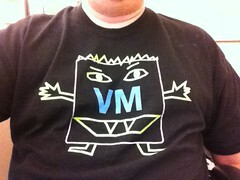 Today I’m as much involved with vSphere as I think I ever have been. Not so much in the operational role I had in the past, but rather a stronger focus on storage integration and meeting with Dell Compellent/VMware customers on a regular basis. I began this article with vSphere 4.1 for a purpose. vSphere 4.1 shipped with a new Enterprise Plus feature named vStorage APIs for Array Integration or VAAI for short (pronounced ‘vee double-ehh eye’ to best avoid twist of the tongue). These APIs offered three different hardware offload mechanisms for block storage enabling the vSphere hypervisor to push some of the storage related heavy lifting to a SAN which supported the APIs. One of the primitives in particular lies at the root of this topic and a technical marketing urban myth that I have seen perpetuated off and on since the initial launch of VAAI. I still see it pop up from time to time through present day. One of the oldest debates in VMware lore is “How many virtual machines should I place on each datastore?” For this discussion, the context is block storage (as opposed to NFS). There were all sorts of opinions as well as technical constraints to be considered. There was the tried and true rule of thumb answer of 10-15-20 which has more than stood the test of time. The best qualified answer was usually: “Whatever fits best for your consolidated environment” which translates to “it depends” and an invoice in consulting language. When VAAI was released, I began to notice a slight but alarming trend of credible sources citing claims that the Atomic Test and Set or Hardware Assisted Locking primitive once and for all solved the VMs per LUN conundrum to the point that the number of VMs per LUN no longer mattered because LUN based SCSI reservations were now a thing of the past. To that point, I’ve got marketing collateral saved on my home network that literally states “unlimited number of VMs per LUN with ATS!” Basically, VAAI is the promise land – if you can get there with compatible storage and can afford E+ licensing, you no longer need to worry about VM placement and LUN sprawl to satisfy performance needs and generally reduce latency across the board. I’ll get to why that doesn’t work in a moment but for the time being I think the general public, especially veterans, remained cautious and less optimistic – and this was good. Then vSphere 5.0 was released. By this time, VAAI was made more highly available and affordable to customers in the Enterprise tier and additional primitives had been added for both block and NFS based storage. In addition, VMware added support for 64TB block datastores without using extents (a true cause for celebration in its own right). This new feature aligned perfectly with the ATS urban myth because where capacity may have been a limiting constraint in the past, that issue has certainly been lifted now. To complement that, consistently growing density drives and reduction of cost/GB in arrays and thin provisioning made larger datastores easily achievable. Marketing decks were updating accordingly. Everything else being equal, we should now have no problem nor hesitation with placing hundreds, if not thousands of virtual machines on a single block datastore as if it were NFS and free from the constraints associated with the SCSI protocol. The ATS VAAI primitive was developed to address infrastructure latency as a result of LUN based SCSI reservations which were necessary for certain operations such as creating and deleting files on a LUN, growing a file in size, creating and extending datastores. We encounter these types of operations by doing things like powering on virtual machines individually or in large groups such as in a VDI environment, creating vSphere snapshots (very popular integration point for backup technologies), provisioning virtual machines from a template. All of these tasks have one thing in common: they result in the change of metadata on the LUN which in turn necessitates a LUN level lock by the vSphere host making the change. This lock, albeit very brief in duration, drives noticeable storage I/O latency in large iterations for the hosts and virtual machines “locked out” of the LUN. The ATS primitive offloads the locking mechanism to the array which only locks the data being updated instead of locking the entire LUN. Any environment which has been historically encumbered by these types of tasks is going to benefit from the ATS primitive and a reduction of storage latency (both reads and writes, sequential and random) will be the result. With that overview of ATS out of the way, let’s revisit the statement again and see if it makes sense: “unlimited number of VMs per LUN with ATS!” If the VMs we’re talking about frequently exhibit the behavior patterns discussed above which cause SCSI reservations, then without a doubt, ATS is going to replace the LUN level locking mechanism as the previous bottleneck and reduce storage latency. This in turn will allow more VMs to be placed on the LUN until the next bottleneck is introduced. Unlimited? Not even close to being correct. And what about VMs which don’t fit the SCSI reservation use case? Suppose I use array based snapshots for data protection? Suppose I don’t use or there is a corporate policy against vSphere snapshots (trust me, they’re out there, they exist)? Maybe I don’t have a large scale VDI environment or boot storms are not a concern. This claim I see from time to time makes no mention of use cases and conceivably applies to me as well meaning in an environment not constrained by classic SCSI reservation problem. I too can leverage VAAI ATS to double, triple, place an unlimited amount of VMs per block datastore. I talk with customers on a fairly regular basis who are literally confused about VM to LUN placement because of mixed messages they receive, especially when it comes to VAAI. Allow me to perfrom some Eric Sloof style VMware myth busting and put the uber VMs per ATS enabled LUN claim to the test. Meet Mike – a DBA who has taken over his organization’s vSphere 5.1 environment. Mike spends the majority of his time keeping up with four different types of database technologies deployed in his datacenter. Unfortunately that doesn’t leave Mike much time to read vSphere Clustering Deepdives or Mastering VMware vSphere but he knows well enough to not use vSphere snapshotting because he has an array based data consistent solution which integrates with each of his databases. Fortunately, Mike has a stable and well performing environment exhibited to the left which the previous vSphere architect left for him. Demanding database VMs, 32 in all, are distributed across eight block datastores. Performance characteristics for each VM in terms of IOPS and Throughput are displayed (these are real numbers generated by Iometer in my lab). The previous vSphere architect was never able to get his organization to buy off on Enterprise licensing and thus the environment lacked VAAI even though their array supported it. Unfortunately for Mike, he tends to trust random marketing advice without thorough validation or research on impact to his environment. When Mike took over, he heard from someone that he could simplify infrastructure management by implementing VAAI ATS and consolidate his existing 32 VMs to just a single 64TB datastore on the same array, plus grow his environment by adding basically an unlimited amount of VMs to the datastore providing there is enough capacity. This information was enough to convince Mike and his management that, risks aside, management and troubleshooting efficiency through a single datastore was definitely the way to go. Mike installed his new licensing, ensured VAAI was enabled on each host of the cluster, and carved up his new 64TB datastore which is backed by the same pool of raw storage and spindles servicing the eight original datastores. Over the weekend, Mike used Storage vMotion to migrate his 32 eager zero thick database VMs from their eight datastores to the new 64TB datastore. He then destroyed his eight original LUNs and for the remainder of that Sunday afternoon, he put his feet up on the desk and basked in the presence of his vSphere Client exhibiting a cluster of hosts and 32 production database VMs running on a single 64TB datastore. On Monday morning, his stores began to open up on the east coast and in the midwest. At about 8:30AM central time, the helpdesk began receiving calls from various stores that the system seemed slow. Par for the course for a Monday morning but with great pride and ethics, Mike began health checks on the database servers anyway. While he was busy with that, stores on the west coast opened for business and then the calls to the helpdesk increased in frequency and urgency. The system was crawling and in some rare cases the application was timing out producing transaction failure messages. Finding no blocking or daytime re-indexing issues at the database layer, Mike turned to the statistical counters for storage and saw a significant decrease in IOPS and Throughput across the board – nearly 50% (again, real Iometer numbers to the right). Conversely, latency (which is not shown) was through the roof which explained the application timeout failures. Mike was bewildered. He had made an additional investment in hardware assisted offload technology and was hoping for a noticeable increase in performance. Least of all, he didn’t expect a net reduction in performance, especially this pronounced. What happened? How is it possible to change the VM:datastore ratio, backed by the same exact pool of storage Tier and RAID type, and come up with a dramatic shift in performance? Especially when one resides in the kingdom of VAAI? Queue Depth. There’s only so much active I/O to go around, per LUN, per host, at any given moment in time. When multiple VMs on the same host reside on the same LUN, they must share the queue depth of that LUN. Queue depth is defined in many places along the path of an I/O and at each point, it specifies how many I/Os per LUN per host can be “active” in terms of being handled and processed (decreases latency) as opposed to being queued or buffered (increases latency). Outside of an environment utilizing SIOC, the queue depth that each virtual machine on a given LUN per host must share is 32 as defined by the default vSphere DSNRO value. What this effectively means is that all virtual machines on a host sharing the same datastore must share a pool of 32 active I/Os for that datastore. After Mike’s consolidation to a single datastore, 16 VMs per host had to share a single LUN with a default queue depth of 32 which reduced each virtual machine’s active IOPS from 16 to 2. Extrapolated across even the most modest sized cluster, each VM above is going to get a fairly sufficient share of the queue depth to work with. Assuming even VM distribution across clustered hosts (you use DRS in automated mode right? ), each host added to the cluster and attached to the shared storage brings with it, by default, an additional 32 IOPS per datastore for VMs to share in. Note that this article is not intended to be an end to end queue depth discussion and safe assumptions are made that the DSNRO value of 32 represents the smallest queue depth in the entire path of the I/O which is generally true with most installations and default HBA card/driver values. In summary, myth busted. Each of the VAAI primitives was developed to address specific storage and fabric bottlenecks. While the ATS primitive is ideal for drastically reducing SCSI reservation based latency and it can increase the VM: datastore ratio to a degree, it was never designed to imply large sums of or an unlimited number of VMs per datastore because this assumption simply does not factor in other block based storage performance inhibitors such as queue depth, RAID pools, controller/LUN ownership model, fabric balancing, risk, etc. Every time I hear the claim, it sounds as foolish as ever. Don’t be fooled. I talk with a lot of customers including those confined to vSphere, storage, and general datacenter management roles. The IT footprint size varies quite a bit between discussions as does the level of experience across technologies. However, one particular topic seems to come up at regular intervals when talking vSphere and storage: Thin Provisioning – where exactly is the right place for it in the stack? At the SAN layer? At the vSphere layer? Both? Virtualization is penetrating datacenters from multiple angles: compute, storage, network, etc. Layers of abstraction seem to be multiplying to provide efficiency, mobility, elasticity, high availability, etc. The conundrum we’re faced with is that some of these virtualization efforts converge. As with many decisions to be made, flexibility yields an array of choices. Does the convergence introduce a conflict between technologies? Do the features “stack”? Do they complement each other? Is one solution better than the other in terms of price or performance? I have few opinions around thin provisioning (and to be clear, this discussion revolves around block storage. Virtual machine disks are natively thin provisioned and written into thin on NFS datastores). 1. Deploy and leverage with confidence. Generally speaking, thin provisioning at either the vSphere or storage layer has proven itself as both cost effective and reliable for the widest variety of workloads including most tier 1 applications. Corner cases around performance needs may present themselves and full provisioning may provide marginal performance benefit at the expense of raw capacity consumed up front in the tier(s) where the data lives. However, full provisioning is just one of many ways to extract additional performance from existing storage. Explore all available options. For everything else, thinly provision. 2. vSphere or storage vendor thin provisioning? From a generic standpoint, it doesn’t matter so much, other than choose at least one to achieve the core benefits around thin provisioning. Where to thin provision isn’t really a question of what’s right, or what’s wrong. It’s about where the integration is the best fit with respect to other storage hosts that may be in the datacenter and what’s appropriate for the organizational roles. Outside of RDMs, thin provisioning at the vSphere or storage layer yields about the same storage efficiency for vSphere environments. For vSphere environments alone, the decision can be boiled down to reporting, visiblity, ease of use, and any special integration your storage vendor might have tied to thin provisioning at the storage layer. The table below covers three scenarios of thin provisioning most commonly brought up. It reflects reporting and storage savings component at the vSphere and SAN layers. In each of the first three use cases, a VM with 100GB of attached .vmdk storage is provisioned of which a little over 3GB is consumed by an OS and the remainder is unused “white space”. A) A 100GB lazy zero thick VM is deployed on a 1TB thinly provisioned LUN. The vSphere Client is unaware of thin provisioning at the SAN layer and reports 100GB of the datastore capacity provisioned into and consumed. The SAN reports 3.37GB of raw storage consumed to SAN Administrators. The other nearly 1TB of raw storage remains available on the SAN for any physical or virtual storage host on the fabric. This is key for the heterogeneous datacenter where storage efficiency needs to be spread and shared across different storage hosts beyond just the vSphere clusters. This is the default provisioning option for vSphere as well as some storage vendors such as Dell Compellent. Being the default, it requires the least amount of administrative overhead and deployment time as well as providing infrastructure consistency. As mentioned in the previous bullet, thin provisioning at the storage layer provides a benefit across the datacenter rather than exclusively for vSphere storage efficiency. All of these benefits really make thin provisioning at the storage layer an overwhelmingly natural choice. B) A 100GB thin VM is deployed on a 1TB fully provisioned LUN. The vSphere Client is aware of thin provisioning at the vSphere layer and reports 100GB of the datastore capacity provisioned into but only 3.08GB consumed. Because this volume was fully provisioned instead of thin provisioned, SAN Administrators see a consumption of 1TB consumed up front from the pool of available raw storage. Nearly 1TB of unconsumed datastore capacity remains available to the vSphere cluster only. Thin provisioning at the vSphere layer does not leave the unconsumed raw storage available to other storage hosts on the fabric. This is not the default provisioning option for vSphere nor is it the default volume provisioning default for shared storage. Thin provisioning at the vSphere layer yields roughly the same storage savings as thin provisioning at the SAN layer. However, only vSphere environments can expose and take advantage of the storage efficiency. Because it is the default deployment option, it requires a slightly higher level of administrative overhead and can lead to environment inconsistency. On the other hand, for SANs which do not support thin provisioning, vSphere thin provisioning is a fantastic option, and the only remaining option for block storage efficiency. C) A 100GB thin VM is deployed on a 1TB thinly provisioned LUN – aka thin on thin. 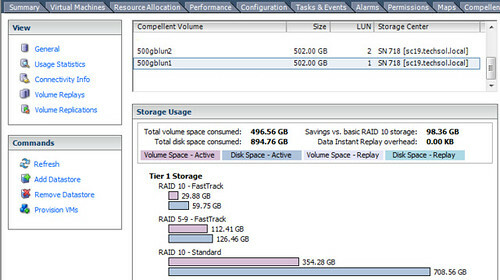 Storage efficiency is reported to both vSphere and SAN Administrator dashboards. The SAN reports 3.08GB of raw storage consumed. The other nearly 1TB of raw storage remains available on the SAN for any physical or virtual storage host on the fabric. Once again, the efficiency benefit is spread across all hosts in the datacenter. This is not the default provisioning option for vSphere and as a result the same inconsistencies mentioned above may result. More importantly, thin provisioning at the vSphere layer on top of thin provisioning at the SAN layer doesn’t provide a significant amount additional storage efficiency. The numbers below show slightly different but I’m going to attribute that difference to non-linear delta caused by VMFS formatting and call them a wash in the grand scheme of things. While thin on thin doesn’t adversely impact the environment, the two approaches don’t stack. Compared to just thin provisioning at the storage layer, the draw for this option is for reporting purposes only. What I really want to call out is the raw storage consumed in the last column. Each cell outlined in red reveals the net raw storage consumed before RAID overhead – and conversely paints a picture of storage savings and efficiency allowing a customer to double dip on storage or provision capacity today at next year’s cost – two popular drivers for thin provisioning. There are two additional but less mainstream considerations to think about: virtual and physical RDMs. Neither can be thinly provisioned at the vSphere layer. Storage efficiency can only come from and be reported on the SAN. D and E) Empty 1TB RDMs (both virtual and physical) are deployed on 1TB LUNs thinly provisioned at the storage layer. Historically, the vSphere Client has always been poor at providing RDM visibility. In this case, the vSphere Client is unaware of thin provisioning at the SAN layer and reports 1TB of storage provisioned (from somewhere unknown – the ultimate abstraction) and consumed. The SAN reports zero raw storage consumed to SAN Administrators. 2TB of raw storage remains available on the SAN for any physical or virtual storage host on the fabric. Again, thin provisioning from your storage vendor is the only way to write thinly into RDMs today. So what is my summarized recommendation on thin provisioning in vSphere, at the SAN, or both? I’ll go back to what I mentioned earlier, if the SAN is shared outside of the vSphere environment, then thin provisioning should be performed at the SAN level so that all datacenter hosts on the storage fabric can leverage provisioned but yet unallocated raw storage.. If the SAN is dedicated to your vSphere environment, then there really no right or wrong answer. At that point it’s going to depend on your reporting needs, maybe the delegation of roles in your organization, and of course the type of storage features you may have that combine with thin provisioning to add additional value. If you’re a Dell Compellent Storage Center customer, let the the vendor provided defaults guide you: Lazy zero thick virtual disks on datastores backed by thinly provisioned LUNs. Thin provisioning at the storage layer is also going to save customers a bundle in unconsumed tier 1 storage costs. Instead of islands of tier 1 pinned to a vSphere cluster, the storage remains freely available in the pool for any other storage host with tier 1 performance needs. For virtual or physical RDMs, thin provisioning on the SAN is the only available option. I don’t recommend thin on thin to compound or double space savings because it simply does not work the way some expect it to. However, if there is a dashboard reporting need, go for it. Depending on your storage vendor, you may have integration available to you that will provide management and reporting across platforms. For instance, suppose we roll with option A above: thin provisioning at the storage layer. Natively we don’t have storage efficiency visibility within the vSphere Client. 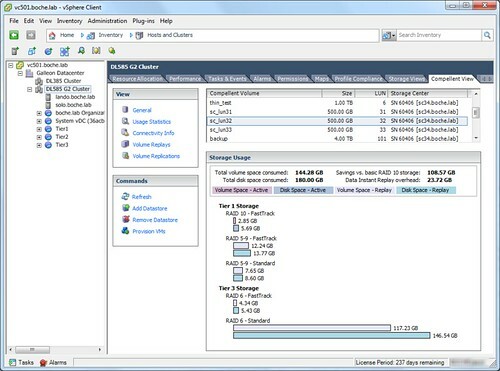 However, storage vendor integration through VASA or a vSphere Client plug-in can bring storage details into the vSphere Client (and vise versa). 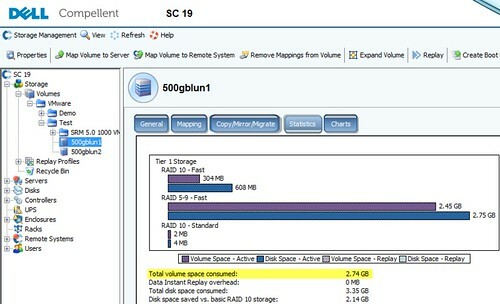 One example is the vSphere Client plug-in from Dell Compellent shown below. Aside from the various storage and virtual machine provisioning tasks it is able to perform, it brings a SAN Administrator’s dashboard into the vSphere Client. Very handy in small to medium sized shops where roles spread across various technological boundaries. Lastly, I thought I’d mention UNMAP – 1/2 of the 4th VAAI primitive for block storage. I wrote an article last summer called Storage: Starting Thin and Staying Thin with VAAI UNMAP. For those interested, the UNMAP primitive works only with thin provisioning at the SAN layer on certified storage platforms. It was not intended to and does not integrate with thinly provisioned vSphere virtual disks alone. Thin .vmdks in which data has been deleted from within will not dehydrate unless storage vMotioned. Raw storage pages will remain “pinned” to the datastore where the .vmdk resides until is is moved or deleted. Only then can the pages be returned back to the pool if the datastore resides on a thin provisioned LUN. While running Microsoft Exchange Server Jetstress on vSphere 5 VMs in the lab, tests were failing about mid way through initializing its several TBs of databases. This was a real head scratcher. Symptoms were unwritable storage or lack of storage capacity. Troubleshooting yielding errors such as “Cannot allocate memory”. 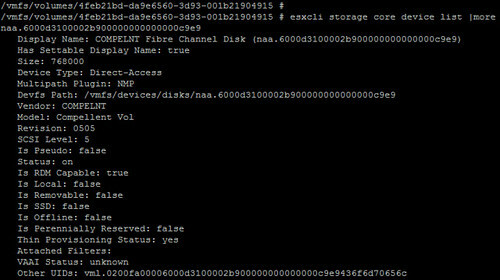 After some tail chasing, the road eventually lead to VMware KB article 1004424: An ESXi/ESX host reports VMFS heap warnings when hosting virtual machines that collectively use 4 TB or 20 TB of virtual disk storage. An ESXi/ESX 3.5/4.0 host has more that 4 terabytes (TB) of virtual disks (.vmdk files) open. After virtual machines are migrated by vSphere HA from one host to another due to a host failover, the virtual machines fail to power on with the error:vSphere HA unsuccessfully failed over this virtual machine. vSphere HA will retry if the maximum number of attempts has not been exceeded. Reason: Cannot allocate memory. cpu15:11905)WARNING: Heap: 2525: Heap cow already at its maximum size. Cannot expand. cpu4:1959755)WARNING:Heap: 2525: Heap vmfs3 already at its maximum size. Cannot expand. Adding a VMDK to a virtual machine running on an ESXi/ESX host where heap VMFS-3 is maxed out fails. When you try to manually power on a migrated virtual machine, you may see the error:The VM failed to resume on the destination during early power on. Reason: 0 (Cannot allocate memory). Cannot open the disk ‘<<Location of the .vmdk>>’ or one of the snapshot disks it depends on. A similar error may appear if you try to migrate or Storage vMotion a virtual machine to a destination ESXi/ESX host on which heap VMFS-3 is maxed out. 2012-05-02T23:24:07.900Z| vmx| AIOGNRC: Failed to open ‘/vmfs/volumes/xxxx-flat.vmdk’ : Cannot allocate memory (c00000002) (0x2013). 2012-05-02T23:24:07.900Z| vmx| DISKLIB-LINK : “/vmfs/volumes/xxxx.vmdk” : failed to open (Cannot allocate memory). 2012-05-02T23:24:07.900Z| vmx| DISKLIB-CHAIN : “/vmfs/volumes/xxxx.vmdk” : failed to open (Cannot allocate memory). 2012-05-02T23:24:07.900Z| vmx| DISKLIB-LIB : Failed to open ‘/vmfs/volumes/xxxx.vmdk’ with flags 0xa Cannot allocate memory (786441). 2012-05-02T23:24:07.900Z| vmx| DISK: Cannot open disk “/vmfs/volumes/xxxx.vmdk”: Cannot allocate memory (786441). 2012-05-02T23:24:07.900Z| vmx| [msg.disk.noBackEnd] Cannot open the disk ‘/vmfs/volumes/xxxx.vmdk’ or one of the snapshot disks it depends on. 2012-05-02T23:24:07.900Z| vmx| [msg.disk.configureDiskError] Reason: Cannot allocate memory. While VMware continues to raise the scale and performance bar for it’s vCloud Suite, this virtual disk and heap size limitation becomes a limiting constraint for monster VMs or vApps. Fortunately, there’s a fairly painless resolution (at least up until a certain point): Increase the Heap Size beyond its default value on each host in the cluster and reboot each host. The advanced host setting to configure is VMFS3.MaxHeapSizeMB. After increasing the heap size and performing a reboot, the ESX(i) kernel will consume additional memory overhead equal to the amount of heap size increase in MB. For example, on vSphere 5, the increase of heap size from 80MB to 256MB will consume an extra 176MB of base memory which cannot be shared with virtual machines or other processes running on the host. Readers may have also noticed an overall decrease in the amount of open virtual disk capacity per host supported in newer generations of vSphere. While I’m not overly concerned at the moment, I’d bet someone out there has a corner case requiring greater than 25TB or even 32TB of powered on virtual disk per host. With two of VMware’s core value propositions being innovation and scalability, I would tip-toe lightly around the phrase “corner case” – it shouldn’t be used as an excuse for its gaps while VMware pushes for 100% data virtualization and vCloud adoption. Short term, the answer may be RDMs. Longer term: vVOLS. Updated 9/14/12: There are some questions in the comments section about what types of stoarge the heap size constraint applies to. VMware has confirmed that heap size and max virtual disk capacity per host applies to VMFS only. The heap size constraint does not apply to RDMs nor does it apply to NFS datastores. Updated 4/4/13: VMware has released patch ESXi500-201303401-BG to address heap issues. This patch makes improvements to both default and maximum limits of open VMDK files per vSphere host. After applying the above patch to each host, the default heap size for VMFS-5 datastores becomes 640MB which supports 60TB of open VMDK files per host. These new default configurations are also the maximum values as well. For additional reading on other fine blogs, see A Small Adjustment and a New VMware Fix will Prevent Heaps of Issues on vSphere VMFS Heap and The Case for Larger Than 2TB Virtual Disks and The Gotcha with VMFS. VMFS heap can grow up to a maximum of 640MB compared to 256MB in earlier release. This is identical to the way that VMFS heap size can grow up to 640MB in a recent patch release (patch 5) for vSphere 5.0. See this earlier post. Maximum heap size for VMFS in vSphere 5.1U1 is set to 640MB by default for new installations. For upgrades, it may retain the values set before upgrade. In such cases, please set the values manually. There is also a new heap configuration “VMFS3.MinHeapSizeMB” which allows administrators to reserve the memory required for the VMFS heap during boot time. Note that “VMFS3.MinHeapSizeMB” cannot be set more than 255MB, but if additional heap is required it can grow up to 640MB. It alleviates the heap consumption issue seen in previous versions, allowing the ~ 60TB of open storage on VMFS-5 volumes per host to be accessed. Burlington, MA – 6 August 2012 – StarWind Software Inc., an innovative provider of storage virtualization software and VM backup technology, announced today a new partnership agreement with Cirrus Tech Ltd., a Canadian web hosting company specializing in VPS, VM and cloud hosting services. Companies collaborate to deliver best-in-breed Cloud services that help customers accelerate their businesses. According to the agreement, Cirrus Tech extends its portfolio with StarWind storage virtualization software and will offer it to their customers as a dedicated storage platform that delivers a highly available and high performance scalable storage infrastructure that is capable of supporting heterogeneous server environments; as Cloud storage for private clouds as well as a robust solution for building Disaster Recovery (DR) plans. StarWind SAN solutions deliver a wide variety of enterprise-class features, such as High Availability (HA), Synchronous Data Mirroring, Remote Asynchronous Replication, CDP/Snapshots, Thin Provisioning, Global Deduplication, etc., that make the stored data highly available, simplify storage management, and ensure business continuity and disaster recovery. To find out more about Cirrus’ web hosting services visit http://www.cirrushosting.com or call 1.877.624.7787. Cirrus Tech Ltd. has been a leader in providing affordable, dependable VHS and VPS hosting services in Canada since 1999. They have hosted and supported hundreds of thousands of websites and applications for Canadian businesses and clients around the world. As a BBB member with an A+ rating, Cirrus Tech is a top-notch Canadian web hosting company with professional support, rigorous reliability and easily upgradable VPS solutions that grow right alongside your business. Their Canadian data center is at 151 Front Street in Toronto. StarWind Software is a global leader in storage management and SAN software for small and midsize companies. StarWind’s flagship product is SAN software that turns any industry-standard Windows Server into a fault-tolerant, fail-safe iSCSI SAN. StarWind iSCSI SAN is qualified for use with VMware, Hyper-V, XenServer and Linux and Unix environments. StarWind Software focuses on providing small and midsize companies with affordable, highly availability storage technology which previously was only available in high-end storage hardware. Advanced enterprise-class features in StarWind include Automated HA Storage Node Failover and Failback (High Availability), Replication across a WAN, CDP and Snapshots, Thin Provisioning and Virtual Tape management. Since 2003, StarWind has pioneered the iSCSI SAN software industry and is the solution of choice for over 30,000 customers worldwide in more than 100 countries and from small and midsize companies to governments and Fortune 1000 companies. Last fall at the VMworld book store in Las Vegas, I picked up sample chapter 6 ALUA from Mostafa Khalil‘s (@MostafaVMW) upcoming book “Storage Design and Implementation in vSphere 5.0“. The level of detail looked fantastic and I could hardly wait for the rest of the book to be released. Fast forward to a month ago, nearing completion I joked with Mostafa that perhaps VCDXs could receive a copy of his new book. 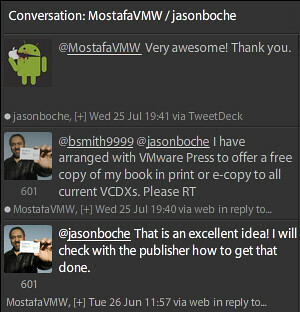 Mostafa gracefully accepted the challenge and delivered the good news tonight that he has arranged with VMware Press for all current VCDXs to receive a free copy of his book via e-copy or print. What Mostafa has done is extremely generous and I’m really looking forward to receiving a copy of his new storage book once it is released (which should be very soon) so that I can read the rest. For me, it’s hard to believe nearly a year has elapsed since vSphere 5 was announced on July 12th. Among the many new features that shipped was an added 4th VAAI primitive for block storage. The primitive itself revolved around thin provisioning and was the sum of two components: UNMAP and STUN. At this time I’m going to go through the UNMAP/Block Space Reclamation process in a lab environment and I’ll leave STUN for a later discussion. Before I jump into the lab, I want frame out a bit of a chronological timeline around the new primitive. Although this 4th primitive was formally launched with vSphere 5 and built into the corresponding platform code that shipped, a few months down the road VMware issued a recall on the UNMAP portion of the primitive due to a discovery made either in the field or in their lab environment. With the UNMAP component recalled, the Thin Provisioning primitive as a whole (including the STUN component) was not supported by VMware. Furthermore, storage vendors could not be certified for the Thin Provisioning VAAI primitive although the features may have been functional if their respective arrays supported it. A short while later, VMware released a patch which, once installed on the ESXi hosts, disabled the UNMAP functionality globally. In March of this year, VMware released vSphere 5.0 Update 1. With this release, VMware implemented the necessary code to resolve the performance issues related to UNMAP. However, VMware did not re-enable the automatic UNMAP mechanism. Instead and in the interim, VMware implemented a manual process for block space reclamation on a per datastore basis regardless of the global UNMAP setting on the host. I believe it is VMware’s intent to bring back “automatic” UNMAP long term but that is purely speculation. This article will walk through the manual process of returning unused blocks to a storage array which supports both thin provisioning and the UNMAP feature. I also want to point out some good information that already exists on UNMAP which introduces the feature and provides a good level of detail. Duncan Epping wrote this piece about a year ago when the feature was launched. Cormac Hogan wrote this article in March when vSphere 5.0 Update 1 was launched and the manual UNMAP process was re-introduced. By this point, if you are unaware of the value of UNMAP, it is simply keeping thin provisioned LUNs thin. By doing so, raw storage is consumed and utilized in the most efficient manner yielding cost savings and better ROI for the business. Arrays which support thin provisioning have been shipping for years. What hasn’t matured is just as important as thin provisioning itself: the ability to stay thin where possible. I’m going to highlight this below in a working example but basically once pages are allocated from a storage pool, they remain pinned to the volume they were originally allocated for, even after the data written to those pages has been deleted or moved. Once the data is gone, the free space remains available to that particular LUN and the storage host which owns it and will continue to manage it – whether or not that free space will ever be needed again in the future for that storage host. Without UNMAP, the pages are never released back to the global storage pool where they may be allocated to some other LUN or storage host whether it be virtual or physical. Ideal use cases for UNMAP: Transient data, Storage vMotion, SDRS, data migration. UNMAP functionality requires the collaboration of both operating system and storage vendors. 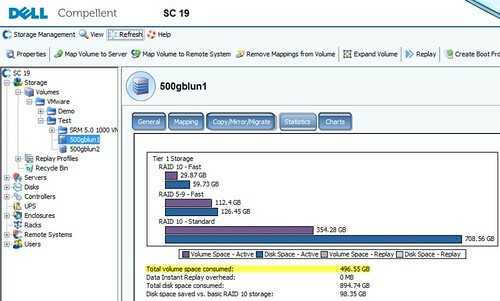 As an example, Dell Compellent Storage Center has supported the T10 UNMAP command going back to early versions of the 5.x Storage Center code, however there has been very little adoption on the OS platform side which is responsible for issuing the UNMAP command to the storage array when data is deleted from a volume. RHEL 6 supports it, vSphere 5.0 Update 1 now supports it, and Windows Server 2012 is slated to be the first Windows platform to support UNMAP. Looking at the volume in Dell Compellent Storage Center, I can see that approximately 500GB of storage is being consumed from the storage page pool. To keep the numbers simple, I’ll ignore actual capacity consumed due to RAID overhead. I’ve now performed a Storage vMotion of the 500GB VM from lun1 to lun2. Again looking at the datastores from a vSphere client perspective, I can see that lun2 is now completely consumed with data while lun1 is no longer occupied – it now has 500GB capacity available. This is where operating systems and storage arrays which do not support UNMAP fall short of keeping a volume thin provisioned. Using the Dell Compellent vSphere Client plug-in, I can see that the 500GB of raw storage originally allocated for lun1 remains pinned with lun1 even though the LUN is empty! I’m also occupying 500GB of additional storage for the virtual machine now residing on lun2. The net here is that as a result of my Storage vMotion, I’m occupying nearly 1TB of storage capacity for a virtual machine that’s half the size. If I continue to Storage vMotion this virtual machine to other LUNs, the problem is compounded and the available capacity in the storage pool continues to drain, effectively raising the high watermark of consumed storage. To add insult to injury, this will more than likely be stranded Tier 1 storage – backed by the most expensive spindles in the array. Following the KB article above, I’ll make sure my datastore supports the UNMAP primitive using esxcli storage core device vaai status get -d <naa ID>. The output shows UNMAP is supported by Dell Compellent Storage Center, in addition to the other three core VAAI primitives (Atomic Test and Set, Copy Offload, and Block Zeroing). I’ll now change to the directory of the datastore and perform the UNMAP using vmkfstools -y 100. It’s worth pointing out here that using a value of 100, although apparently supported, ultimately fails. I reran the command using a value of 99% which successfully unmapped 500GB in about 3 minutes. Also important to note is VMware recommends the reclaim be run after hours or during a maintenance window with maximum recommended reclaim percentage of 60%. This value is pointed out by Duncan in the article I linked above and it’s also noted when providing a reclaim value outside of the acceptable parameters of 0-100. Here’s the reasoning behind the value: When the manual UNMAP process is run, it balloons up a temporary hidden file at the root of the datastore which the UNMAP is being run against. You won’t see this balloon file with the vSphere Client’s Datastore Browser as it is hidden. You can catch it quickly while UNMAP is running by issuing the ls -l -a command against the datastore directory. The file will be named .vmfsBalloon along with a generated suffix. This file will quickly grow to the size of data being unmapped (this is actually noted when the UNMAP command is run and evident in the screenshot above). Once the UNMAP is completed, the .vmfsBalloon file is removed. For a more detailed explanation behind the .vmfsBalloon file, check out this blog article. The bottom line is that the datastore needs as much free capacity as what is being unmapped. VMware’s recommended value of 60% reclaim is actually a broad assumption that the datastore will have at least 60% capacity available at the time UNMAP is being run. For obvious reasons, we don’t want to run the datastore out of capacity with the .vmfsBalloon file, especially if there are still VMs running on it. My recommendation if you are unsure or simply bad at math: start with a smaller percentage of block reclaim initially and perform multiple iterations of UNMAP safely until all unused blocks are returned to the storage pool. To wrap up this procedure, after the UNMAP step has been run with a value of 99%, I can now see from Storage Center that nearly all pages have been returned to the page pool and 500gbvol1 is only consuming a small amount of raw storage comparatively – basically the 1% I wasn’t able to UNMAP using the value of 99% earlier. If I so chose, I could run the UNMAP process again with a value of 99% and that should return just about all of the 2.74GB still being consumed, minus the space consumed for VMFS-5 formatting. The last thing I want to emphasize is that today, UNMAP works at the VMFS datastore layer and isn’t designed to work inside the encapsulated virtual machine. In other words, if I delete a file inside a guest operating system running on top of the vSphere hypervisor with attached block storage, that space can’t be liberated with UNMAP. As a vSphere and storage enthusiast, for me that would be next on the wish list and might be considered by others as the next logical step in storage virtualization. And although UNMAP doesn’t show up in Windows platforms until 2012, Dell Compellent has developed an agent which accomplishes the free space recovery on earlier versions of Windows in combination with a physical raw device mapping (RDM). Update 7/2/12: VMware Labs released its latest fling – Guest Reclaim. Guest Reclaim reclaims dead space from NTFS volumes hosted on a thin provisioned SCSI disk. The tool can also reclaim space from full disks and partitions, thereby wiping off the file systems on it. As the tool deals with active data, please take all precautionary measures understanding the SCSI UNMAP framework and backing up important data. A storage array that supports thin provisioning can repurpose the reclaimed space to satisfy allocation requests for some other thin provisioned LUN within the same array. A hypervisor file system can repurpose the reclaimed space from one virtual disk for satisfying allocation needs of some other virtual disk within the same data store. Dell Storage Forum kicks off in Boston next week and Spousetivities will be there to ensure a good time is had by all. If you’ve never been to Boston or if you haven’t had a chance to look around, you’re in for a treat. Crystal has an array of activities queued up (see what I did there?) including whale watching, a tour of MIT and/or Harvard via trolley or walking, a trolley tour of historic Boston (I highly recommend this one, lots of history in Boston), a wine tour, as well as a welcome breakfast to get things started and a private lunch cruise. If you’d like to learn more or if you’d like to sign up for one or more of these events, follow this link – Spousetivities even has deals to save you money on your itinerary.